of some limitations of the MAX529 chip. allows for a wider range of output voltages. TRIGGER output voltage of between 8V (12V supply) and 10V (15V supply). GATE Mode where the TRIGGER output is controlled by the receipt of valid NOTE ON/NOTE OFF messages. In both cases the maximum amplitude of the TRIGGER output is determined by the VELOCITY value of the respective NOTE ON message as a proportion of the maximum set output voltage. Settings are common to all outputs. are paired up 1-2, 3-4, 5-6 & 7-8 with each pair sharing the same MIDI address. The first output of each pair responds as normal to its associated MIDI message. The second output will only trigger when the velocity value is greater than 120. The minimal installation option is to mount the MIDI-Retrofit-8 inside the unit to be controlled, wiring the TRIGGER outputs directly to the relevant points on the instrument and connecting to a suitable power supply inside the unit. The MIDI-IN socket being the only item that requires to be mounted on the unit for easy access. This option is suited for installations where the MIDI Note assignments will be set once (or very infrequently). The standard installation optionally brings the LEARN switch out to a user accessible point as well as installing LEDs to indicate the status of each of the TRIGGER outputs. During normal use, the LEDs indicate the status of each TRIGGER output. While in LEARN mode they indicate which channel is beingh programmed. This is useful if you wish to change the MIDI Note assignments often and/or desire a visual indication of the operation of the MIDI-Retrofit-8. 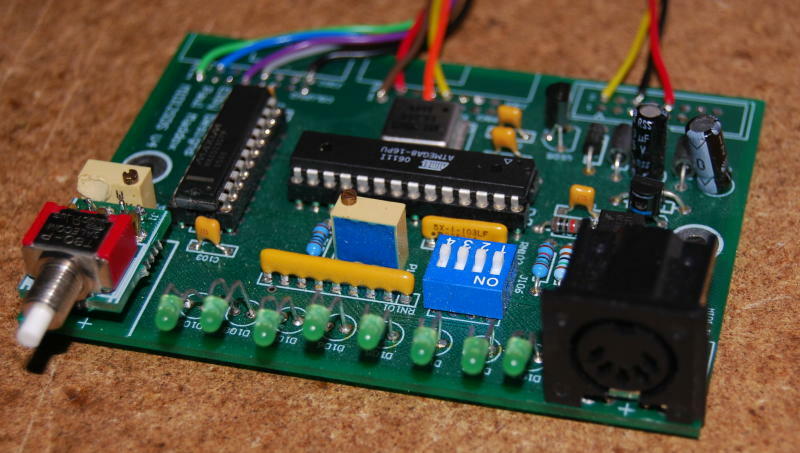 If LED status is required for programming but is not needed for normal operation (or you don't want to mount the LEDs on your unit, the MIDI-Retrofit-8 pcb allows for the LEDs to be mounted on the pcb directly. programming status during the LEARN mode. ready for direct rack mounting, or it can just as easily be used free-standing. so providing control for most larger drum machines on the market. PARALLEL with the equipments internal controller. So now you can augment your drum machine by adding your own extra MIDI triggers during a sequence run. 1 x MIDI-Retrofit-8 Component Kit. 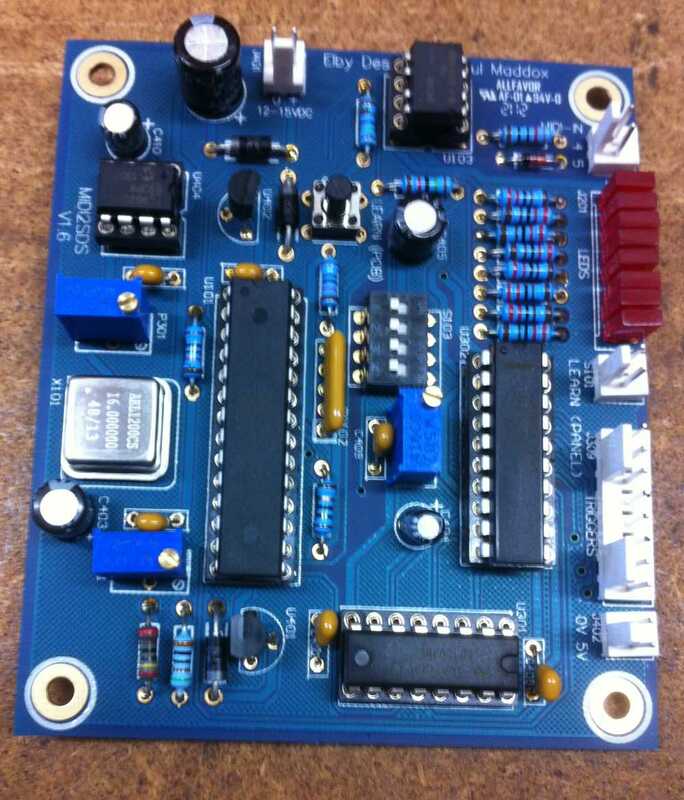 These 2 items will provide you with the pcb and suffcient components to dress the pcb. This also includes the MIDI-IN socket and a LEARN switch. Trigger Output LED's to provide a visual status during the LEARN mode.